Product prices and availability are accurate as of 2019-04-12 18:52:01 UTC and are subject to change. Any price and availability information displayed on http://www.amazon.com/ at the time of purchase will apply to the purchase of this product. The YB16CL-B GEL is a 12V 19AH GEL (Maintenance Free) battery. Requires no addition of water during the life of the battery. 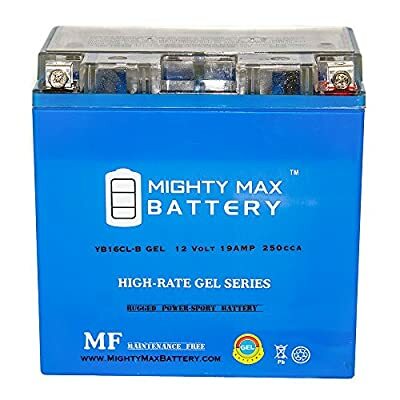 The Mighty Max YB16CL-B GEL is a TRUE DEEP CYCLE battery that can be mounted in any position, requires no maintenance. 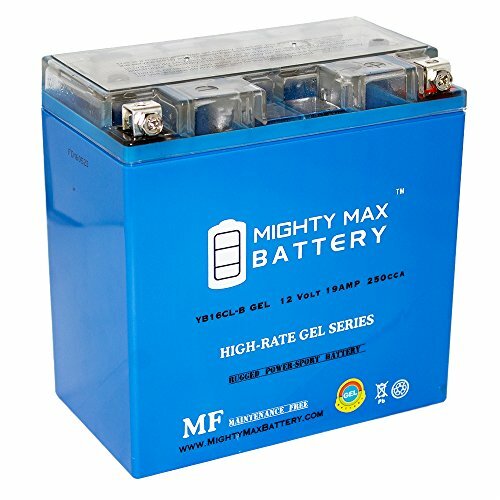 When a Gel Cell battery is charged, no hazardous fumes escape the battery case, gases are processed within the battery itself. Common uses for the YB16CL-B GEL: ATVs, Motorcycles, Personal Watercraft, Jet Ski's, Snowmobiles and more. No acid mist and pollution to the environment when charging and discharging. High capacity: 10-20% higher comparing to that of VRLA. Low self-discharging and durable for storage. Nice ability for resilience after over-discharge and the capacity of high discharge current increases by 30% over VRLA. YB16CL-B GEL is a 12V 19AH 250 Cold Cranking Amps (CCA) GEL (Maintenance Free) Battery Dimensions: 6.75 inches x 3.81 inches x 6.81 inches. Polarity: Negative on left, Positive on right. Listing is for the Battery and Screws only. No wire harness or mounting accessories included. Factory activated GEL battery. Maintenance free. No acid pack needed. Advanced design works right out of the box and requires no maintenance yet offers the option to prolong the standard life by adding extra electrolytes. True deep cycle battery that can be mounted in any position, Resists shocks and vibration. Long lasting high performance in high and low temperatures. Environment friendly, leaving no pollution to the environment while charging and discharging. Zero fumes or chemicals escape the battery casing. All chemical reactions are done within the battery itself.